The Butter London 'Backstage Basics' Anniversary Set is a six piece set available at this year's Nordstrom Anniversary Sale. It contains Butter London Hardwear Topcoat, Butter London Nail Foundation Basecoat, Butter London Thames nail lacquer, Butter London Powder Room Lacquer remover, a Butter London nail file, and a Butter London polish of your choice. I've had the chance to scope out this set, courtesy of Butter London, and have an overview to share with you today! The set conveniently comes complete with all the basics necessary for a good manicure! For starters, I really like the generously apportioned Butter London Hardwear Top Coat and Butter London Nail Foundation Base Coat. I'd been wanting to try them for quite some time, so it was a real treat. So far, I'm enjoying both! The Butter London nail file has a fun curved shape and the Butter London logo printed on both sides. Butter London Powder Room is an acetone-free nail remover with a powdery scent. The bottle comes in a convenient, TSA-friendly size for the jet-setting fashionista! Every set also comes with a bottle of Butter London Thames nail lacquer, a shimmery lagoon blue-green nail polish (swatched above). With the Butter London 'Backstage Basics' Anniversary set, you also get to add a Butter London nail lacquer of your choice. I've included a few shades from my Butter London collection below. Check out the caption for names and links to nail swatches for each color. The Butter London 'Backstage Basics' Anniversary set ($70 value for $39) is available during the Nordstrom Anniversary sale 2013. Overall, I'm really enjoying the set; it's full of basic products that I'm sure to use for my weekly polish change. It's a great set (and a great deal!) for those looking to explore and/or replenish their polish collection! Thanks for reading! Have you picked up any beauty exclusives from the Nordstrom Anniversary sale? What Butter London polish would you choose to add to your 'Backstage Basics' set? July has been a busy, busy month for me! With a new line of work and pressing schedule, I've had less time to dabble, and instead have relied on a few select favorites to get me through the month. Today I'm sharing a few of my favorite things for July 2013. Enjoy! 1. Harper's BAZAAR (August 2013) - Harper's BAZAAR is my favorite subscription, hands down. The photography is gorgeous --- and this month especially so! I was blown away by the August 2013 cover and its stunning southwest scenery. Traveling to National Parks is one of my passions --- and I loved how it reminded me of my trip to Arches and Canyonlands National Parks a couple years ago (see my photos here and here). 2. CHANEL Double Perfection Lumière Foundation in B20 - This has been my foundation BFF for the past few months. Thanks to a busier schedule, I've had less time in the morning to prep - a powder foundation definitely saves time! 3. Diptyque Baies Mini Candle - This was a surprise gift from Mr. Lovey! Blackcurrant and rose make a stunning combination. I'm also loving samples of Diptyque L'Ombre dans L'Eau, which is the companion fragrance to Baies. 4. NARS Exotic Dance eyeshadow duo (reviewed here) - I tend to shy away from golds, however given the current climate I can't seem to get enough of it! This oldie-but-goodie has been getting some much deserved love this month. 5. Kate Spade Earrings - My golden boat earrings from Kate Spade are my favorite accessory purchase this summer. I have the matching bracelet as well, which you may have seen on my Instagram feed! I'm definitely getting a warm vibe from my July favorites --- with the flaming rocks and rich gold tones seen here. Being from Chicago's cold climate, I suppose I can't help but revel in the heat of summer! Thanks for reading --- and I hope everyone's had a great summer so far! What are colors and products you're loving right now? If my last post (on Kate Spade Live Colorfully) is any indication, I think it's fair to say that I love my colors! This fall, Butter London's given me a great way to get my ROYGBIV on with the brand new Butter London Colour Clash collection (Autumn/Winter 2013). I've been enjoying a few nail colors from the collection, courtesy of Butter London, and have a review and comparison swatches to share with you today! Butter London Cake-Hole is a nearly neon pink nail polish with a semi-matte finish. Butter London Silly Billy is a tangerine (not to be confused with orange) creme nail polish. Butter London Wellies is a yellow-green creme nail polish. I like how clean the color looks; it's clearly reminiscent of the eponymous British rain boots! Butter London Giddy Kipper is an indigo nail lacquer with a very subtle shimmer. I would say it's slightly more purple than is shown in my swatch below. Strong sunlight tends to make it more blue, while shade brings out the purple tones. When it comes to nail polish, nuances are everything, so I've prepared a set of comparison swatches for the Butter London Colour Clash collection. Butter London Primrose Hill Picnic (reviewed here) is a cooler hot pink than Butter London Cake-Hole, which is comparatively lighter, more neon, and matte. Sephora by OPI Hi-Def is a solid orange, while Butter London Silly Billy is lighter and more tangerine. Butter London Wellies is a yellow-green; you can see the green tones when compared with the bright yellow of Butter London Cheeky Chops (reviewed here). The intensity of color is similar between the two.You can appreciate the indigo tones in Butter London Giddy Kipper when compared to the bright blue of Essie Bouncer It's Me. The Butter London Colour Clash collection has a righteous rainbow of bright nail colors for this fall! I especially like how each of the four colors shown have a crisp, clean feel. My current favorites from the bunch are Butter London Silly Billy and Butter London Wellies; they're nice renditions of tricky-to-wear colors. Thanks for reading! Which Butter London Colour Clash nail color stands out to you? What Butter London polishes have you tried recently? What brights are you wearing now? P.S. For more Butter London, be sure to check out my reviews of the Butter London Pop Art collection and the Butter London Royals collection! As a color fan-(atic), I'm oft delighted by Kate Spade's colorful creations. The brand has a way with color and imagery that just makes you smile. A few years ago, Kate Spade launched Twirl; I liked it so much that I picked up a rollerball of the perfume. Naturally, I couldn't wait to get my hands on Kate Spade Live Colorfully once it was released! The bottle for Kate Spade Live Colorfully was inspired by the light refracting properties of prisms. From the front, it appears to be a bright coral. However, a turn of the flask reveals that there are actually two colored panes, one pink and one yellow, (bow)-tied together by glass. This colorful duality is not just pretty; it also hints at the nature of the scent within (more on that below)! 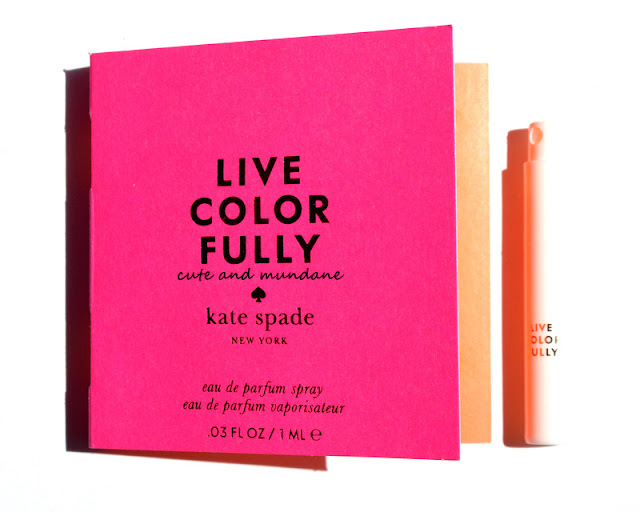 Kate Spade Live Colorfully Eau de Parfum is a creamy white floral with hints of waterlily and coconut. Rich white florals open the scent; it's easy to pick out the distinct woody green character of gardenia combined with the dulcet and mellifluous tones of its Polynesian relative, the tiare flower. (I love how the scent of tiare practically transports me to the Pacific islands!) After the grand whites decrescendo, a pretty little stanza follows : a soft and sweet mandarin perfumes the air, followed by the aquatic green fragrance of a water lily. It's a segment that provides a delicate breather from the weightiness of the perfume. The white florals return a second time, and along with them comes coconut water, which at first has a cool dry texture, but becomes creamier over time as vanilla seeps in to fill it out. The final dry-down involves white florals, velvety coconut, and a hint of green waterlily. Live Colorfully is very long lasting. I found that Kate Spade Live Colorfully evoked not one, but two places, which was quite an unusual experience! The first was Tahiti, thanks to the heavy perfume of the tiare flower and coconut. In fact, the tiare and coconut oil combination is a classic fragrance pairing in Tahiti called Monoi. The coconut in Live Colorfully is a slight variation as it smells of the lighter coconut water rather than the creamier milk. The water theme in the coconut provides a lucid transition into a another watery, albeit very different environment. The aquatic green notes of the waterlily evokes the second location: a well shaded garden pond --- perhaps like Monet's garden at Giverny, France! (You can read more about Monet's Water Lilies in my recent Inspired by Art post!) This duality in Kate Spade Live Colorfully was fascinating --- it is both French countryside and French Polynesia in one bottle! 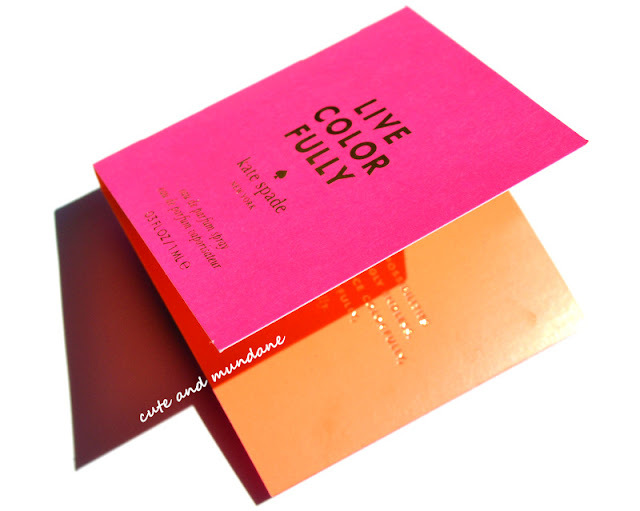 Kate Spade Live Colorfully is a summery white floral with notes of velvety coconut and aquatic water lily. Like the bottle's bright yellow and pink panes that combine to create a cool coral, the scent is a unified duality as well. Through a common theme of water, our noses transport us to a lush island bathed in golden sunlight, as well as to the bright pink blooms of a waterlily pond draped with willows. The resultant combination is both colorful and cohesive. Overall, you could say I'm a big fan! I'll certainly be indulging in a few spritzes of Kate Spade Live Colorfully this summer. Thanks for reading! Have you tried Kate Spade Live Colorfully? What perfumes have you been enjoying this summer? P.S. 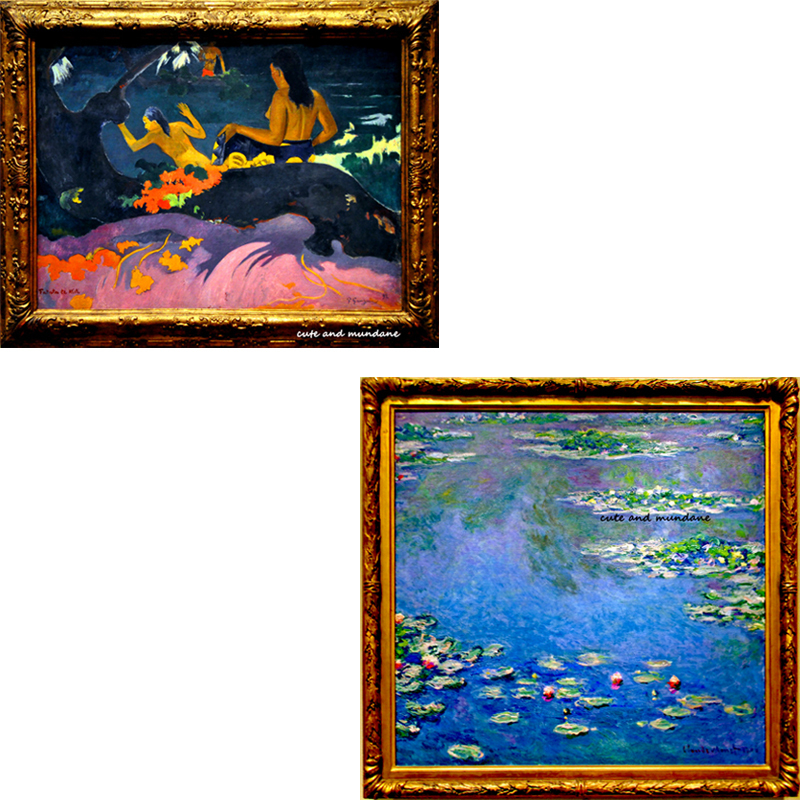 For more on the art shown in this post, be sure to check out my Inspired by Art series featuring Monet's waterlilies and Gaugain's Tahiti. Butter London has a brand new collection of brights inspired by the vivid colors of artists like Warhol, Lichtenstein, and Ruscha! The Butter London Pop Art Collection is a set of three colors that have added a punchy vibe to my summer nail routine, courtesy of Butter London! The three colors included are: Butter London Keks, Butter London Primrose Hill Picnic, and Butter London Cheeky Chops. Butter London Keks is a brand new nail polish in the Butter London lineup. It's a bright wave blue with a semi-matte finish that I really like. The formula is quite opaque and 1-2 coats should do the trick. Butter London Cheeky Chops is a canary-yellow creme nail polish. The formula is actually quite nice for a yellow; it was mostly opaque after two coats and fully after three. Butter London Primrose Hill Picnic is a bright pink creme nail polish that's perfect year-round. I've made some comparison swatches below so you can get a better idea of the colors in the Butter London Pop Art Collection! Butter London Keks nail lacquer is a true wave blue that is less green than Sephora by OPI Skinny Jeans. Butter London Primrose Hill Picnic is a hot pink that is slightly more intense and more of a red-pink than NARS Schiap. Butter London Cheeky Chops is slightly lighter than the true yellow of China Glaze Happy Go-Lucky. The Butter London Pop Art Collection ($45) is a set of beautifully bright nail lacquers. Butter London Keks, Primrose Hill Picnic, and Cheeky Chops would look great on their own, or even combined together as nail art! The set is available online at Butter London. Thanks for reading! 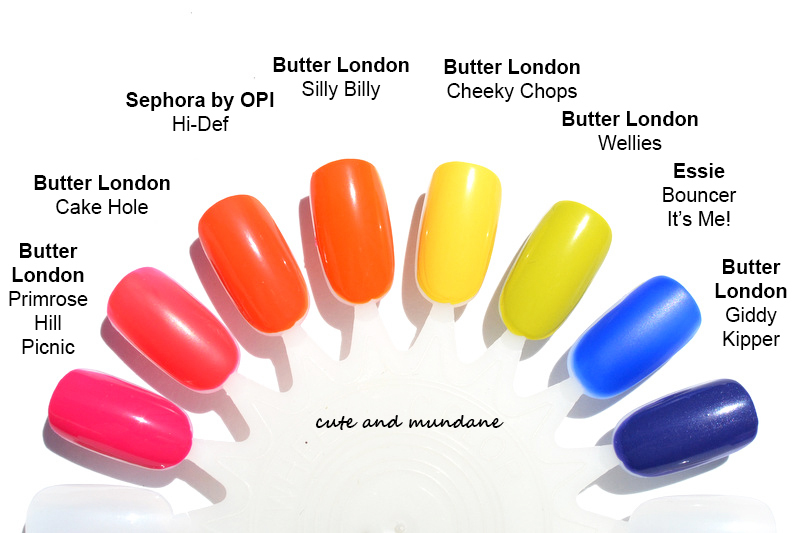 Which of the Butter London Pop Art shades do you like best? What bright nail colors have you been wearing this summer? P.S. For more Butter London, be sure to check out my reviews of the Butter London Royals collection and Butter London Summer 2013 collection!